WebPuff is a comprehensive Web-based emergency management decision support system designed to aid in planning for, responding to, and recovering from a chemical accident or incident. The Urban and Regional Information Systems Association (URISA) presented WebPuff with an Exemplary Systems in Government (ESIG) Award. WebPuff meets rigorous military and government requirements for use as a critical emergency protection system. WebPuff incorporates D2-Puff™, IEM’s advanced chemical dispersion model, one of only three DOD-approved chemical dispersion models. D2-Puff has been integrated into the Joint Effects Model (JEM), which will become the single general purpose, accredited hazard prediction and tracking model used by DOD for WMD. D2-Puff is the only model capable of representing EPA’s required Acute Exposure Guideline Levels (AEGLs). D2-Puff passed a formal independent validation and verification (IV&V) test by Dugway Proving Ground. 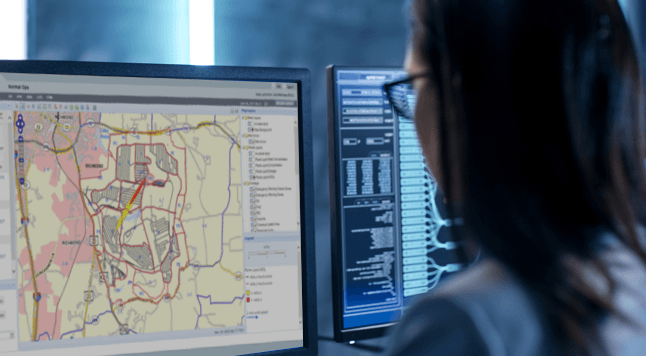 WebPuff combines the latest in GIS and browser technologies, delivering impressive GIS capabilities over the web without compromising robustness, stability, and the tough security standards required by DOD. In comparison to previous hazard prediction models used by the Army, WebPuff presents a more sophisticated decision support system for dealing with chemical releases. The D2-Puff model embedded in WebPuff factors in variable weather conditions such as wind speed and wind direction as well as topography. Because you seldom know when an emergency will strike and where you’ll be when it does, users can access WebPuff’s critical event information from a variety of locations: local EOC, home, and handheld devices in the field. WebPuff includes IEM’s SafePort™ protective action recommendation algorithm. SafePort™ uses modeling data, as well as a self-contained traffic model, to help protect populations in an affected area by determining the efficacy of evacuation versus sheltering in place. With this knowledge, decision makers can make faster and better informed decisions on how best to protect the public during a chemical emergency. WebPuff natively supports open source GIS Consortium requirements, liberating agencies and departments from the confines of vendor-supplied data, tools, and systems. WebPuff is used daily to support operations at all Chemical Stockpile Emergency Preparedness Program (CSEPP) sites around the country where chemical weapons are currently being demilitarized.